Since most hiking boots are made largely from Gore-Tex and high-tech composite fabrics, you might assume that there’d be plenty of fully vegan options on the market. But, with most companies using at least a little leather in their boots, as well as other animal products in the manufacturing process, this isn’t actually the case. You really need to do some sleuthing to find a model that’s truly vegan. To make this search even more difficult, some some vegan boots brands rest on the claim that their boots are vegan, without putting much concern into their quality. What Makes for Comfortable Hiking Boots? 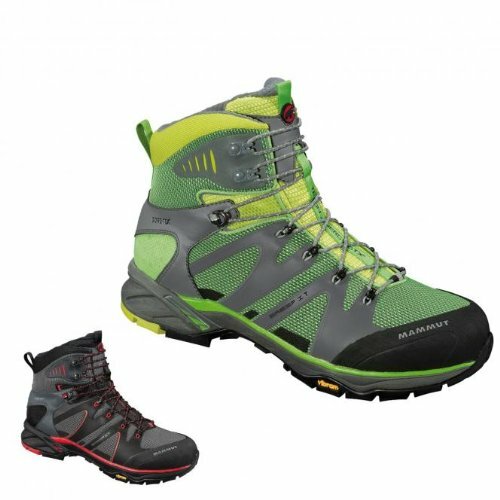 How Heavy Should My Hiking Boots Be? How Durable Do My Hiking Boots Need to Be? 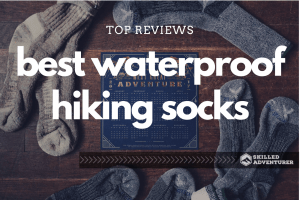 Should I Buy Waterproof Hiking Boots? What Makes Hiking Boots Stable? What Makes a Hiking Boot Have Good Traction? Choosing a great pair of vegan hiking boots is not much different than buying non-vegan ones. You still want them to be comfortable, lightweight, durable, water-resistant, stable, and have plenty of traction. The biggest factor in whether a hiking boot is comfortable is how much cushion is built into the footbed. A thicker insole will shield your feet on a rocky traverse, but it’ll also limit your ability to sense what’s going on underfoot. Because of that, getting proper foot placement on a scramble is more challenging when there’s more cushioning. Flexibility is the second major factor in how comfortable your boots are. Trail running shoes provide the most flex, with a relatively thin sole and no rigid support in the footbed. At the other end of the scale are mountaineering boots, which have a thick sole of hard rubber and usually contain a metal or composite shank (a thin plate that runs the length of the boot sole and provides extra stiffness). Lastly, the stiffness of the outsole and the material in the upper affects a boot’s comfort – and this is where non-vegan and vegan hiking boots tend to differ. Vegan boots are often more comfortable and easier to break in, as a upper leather needs quite a bit of bending to become pliable. Some synthetic uppers are more comfortable than others, though. Even when they’re vegan, thicker mountaineering boots feel more like a plastic ski boot, while trail runners can be as comfortable as everyday sneakers. It’s said that each extra pound on your feet and ankles feels like five pounds on your back. There’s no question that lighter hiking boots will feel more comfortable and leave you less exhausted after several hours of hiking. However, a boot’s weight is usually tied to other features like waterproofing and ankle support. One positive is that synthetic materials typically weigh less than leather, so vegan hiking boots are naturally a bit lighter. The short answer: as durable as possible. After all, no one likes buying new boots at the beginning of each season. 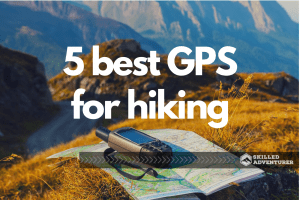 However, you have to be realistic with how long they’ll last; most hiking boots will be good for somewhere between 500 and 1,000 miles of trail. Vegan footwear is, unfortunately, known for being less durable than models made with leather and other animal products. But as more consumers are demanding that their outdoor equipment be animal-free, some companies have taken notice and starting putting extra effort into building more durable synthetic footwear. Waterproof boots are not always better, and whether you need them is determined by the terrain you hike most often. Despite manufacturers’ claims that they can create a waterproof boot that’s breathable, the fact is that the more waterproof your boot is, the more your feet will be sweating. Hiking boots with a waterproof membrane are best for inclement weather and wet trails. A dry foot is a warm foot, and a damp foot can be dangerous in cold wet weather. However, if you’re hiking in hot weather and on dry trails, non-waterproof boots are great option. Even if they get completely soaked during a creek crossing, your feet can be dry in an hour or so. This is an age-old debate in the hiking world: should you get a taller hiking boot that provides more ankle support, or something more minimalist that lets you “feel” the terrain and avoid the missteps that make ankle support necessary in the first place? Bulky hiking boots have thick soles that lift your feet higher off the ground, creating instability. To counteract this problem, they have a higher cuff that catches your ankle before it can get injured. However, these taller boots are also more comfortable on long treks with heavy packs since they provide greater cushioning on each step. But many hikers prefer to forgo the ankle support and wear trail running shoes, which have a thinner, more flexible sole. Not only does this give you a better sense of the terrain you’re walking over, it also strengthens your ankles by forcing them to make small corrections to center your weight. However, the thinner sole will be less comfortable when you’re carrying a lot of weight on your back. 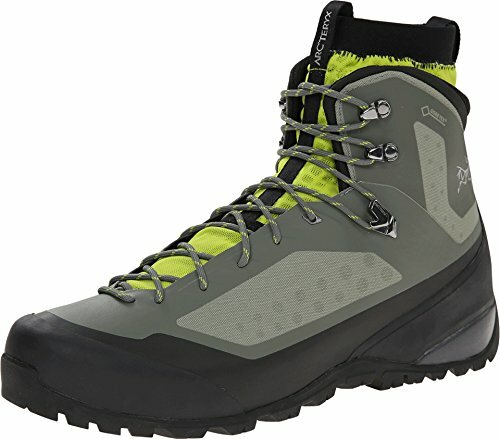 Boots designed for climbing muddy slopes will have thick lugs (the pieces of raised rubber on the sole), which help the boot bite into slippery terrain. However, these lugs won’t do much good on a rocky scramble, as they mean less surface area is in contact with the mountain. For better traction on rocky terrain, you need a softer, stickier rubber, which is usually found in trail running shoes. They also have more flex, allowing your foot curl around the rock and get more surface area in contact with it. Manufacturers rarely advertise the hardness of the outsole, so you really need to pay attention to reviews to find out how much traction they have. Arc’Teryx is known for being the cream of the crop in the hiking world, and their products come with a price tag to match. However, you can’t argue with the fact that they have made a truly impressive vegan boot with the Bora GTX. The most noticeable feature with these is their use of a two-piece design: a waterproof bootie that goes inside an even more waterproof shell. This is a great concept, because the bootie is highly breathable, which works since it has a durable outer layer to protect it. By separating the two components, they’ve made both of them more functional. The one downside to the Boras is that they don’t have a ton of ankle protection. The padding is lacking for a mid-cut boot, but they’re still sturdy enough that you won’t roll an ankle easily. Price wise, the Arc’Teryx Bora’s are going to be outside of most hikers’ budgets. However, for those willing to pay for the best, they’re an amazing pair of boots. The Mammut T Energy may look like something out of a sci-fi movie with its sleek design and flashy colors, but it’s actually the perfect boot for getting back to nature. The Gore-Tex lining makes these boots very waterproof but still moderately breathable. In these boots, your feet will still be sweating on hot days, but if you need to keep your feet dry, it’s worth it. This is also an amazing boot when it comes to ankle protection. 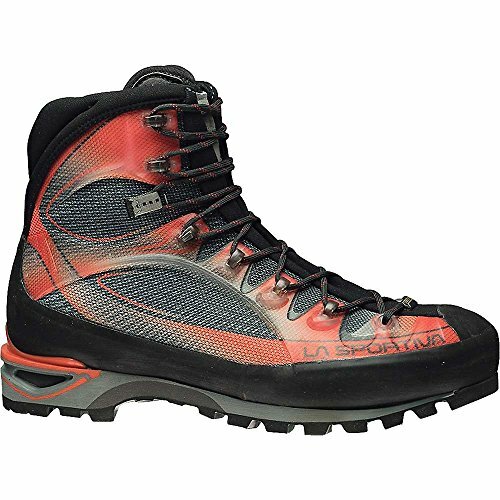 Its high cuff and ample ankle padding will give you the peace of mind to do deep backcountry exploring without the fear of an ankle injury. One downside to the Energy’s is that they’re pretty stiff, which makes them a poor choice for scrambling or any type of hiking where you need to feel the ground. They’re great for a backpacking trip with a heavy pack, but the hard sole will tire out feet your on uneven terrain. When you need something solid and fully waterproof, the Mammut T Energy’s will be your go-to vegan boot. They’re not as good for long hikes, but for anything under 10 miles, they’re great. 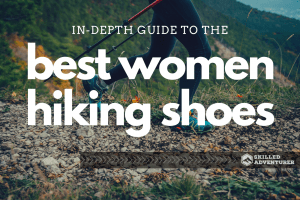 Adidas has made their name in the running shoe market, but their hiking boots bear little resemblance to the lightweight footwear that made them popular. At 15.2 ounces, the Terrex Swifts are actually a little heavy for a low-cut hiking boot. However, they do provide excellent traction, thanks to an aggressive tread and a sole that is flexible enough for scrambling. They’re also quite durable, even though they look almost like a sneaker at first glance. These boots are waterproof enough for crossing puddles on the trail, but don’t expect to stay dry when fording a stream (they’re low-tops anyway…). On the other hand, they’re quite breathable, which is great if you’re using them for trail running and working up a heavy sweat. The speed lock lacing system works like a drawstring, which makes taking them on and off fast and easy. However, it robs you of the flexibility that comes with strategically lacing your boots to protect problem areas of your foot. 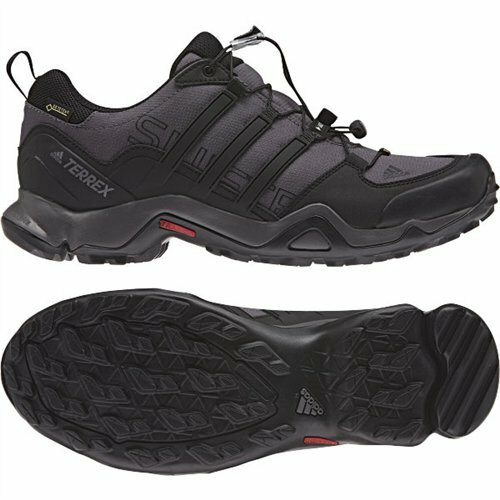 The Adidas Outdoor Terrex Swift is a solid option for trail runners who want a shoe that will also let them do some hiking. Like the Mammut’s listed above, the Sportiva Trango Cubes have a decidedly futuristic look to them. Perhaps it’s not surprising, then, that they’re quite durable and completely waterproof. As the Trango Cubes were designed as a mountaineering boot, they feature an aggressive tread pattern, excellent durability, a thick sole, and top-notch ankle support, and they’re comfortable to boot. They are an excellent choice for wet spring and autumn trails, and can even be used during slightly colder months. The water shedding design makes them seem like a good winter boot, but since they’re not insulated, stick to wearing them towards the end of the season when the snow is at its wettest. The biggest downside of the Trango Cubes is that all those features come with a high price tag, and at a relatively high weight. You won’t be running any trails with these, but if you need the waterproofing and the ankle support, they’re an excellent choice. Altra is primarily known for their lightweight trail runners, so there’s reason to be skeptical of their mid-cut hiking boots. Set those worries aside; they’ve taken some of the best qualities of trail runners - comfort and lightweight design - and built them into a solid hiking boot. Hikers love these boots for their comfort, which comes from a 5mm contoured footbed and plenty of padding around the ankles. They also have a wider toe box, which prevents your toes from getting mashed on the downhills. The Lone Peaks are fairly lightweight at just 15.5 ounces, less than you’d expect for a mid-cut boot with a thick sole. The featherweight design comes at a cost, though, as they seem to wear out fairly quickly. While most boots use a waterproof but breathable liner, Altra created the Neoshell, an impervious layer that goes around the boot’s exterior and prevents water from ever getting inside. It’s fairly good at keeping water out, but it’s also great at keeping water in. On a hot day, your feet will get quite sweaty in a pair of these. The Altra Lone Peaks are a good choice for hikers who want to go fast and light, but still want to be comfortable. Many hikers are strong conservationists and are passionate about animal welfare, but what they put on their feet is often leather. The industry has provided few options that are completely animal-free, and even fewer that are made to the same quality standards as their non-vegan boots. However, all of that is changing, and there are several great vegan boots on the market. When it comes to buying the very best vegan hiking boots, you can’t beat the Arc’teryx Bora. Its innovative two-piece design makes it both waterproof and highly breathable. Additionally, the inner bootie can be removed and dried out much faster than a standard hiking boot. 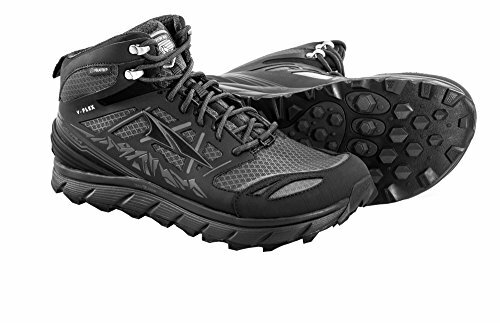 The cost puts these out of range of most hikers, but perhaps other manufacturers will latch on to this design trick and start making similar boots of their own. There are plenty of great options if you don’t want to spend $300+ on your hiking boots, though. You just need to consider what features are most important to you, and choose the pair that’s best at those things. Getting the right hiking boot for your needs will make your time on the trail go a lot more smoothly. Hi there, my name is Jason and I am the creator and editor of this site. My activities include hiking, skiing, mountain biking, camping, and backpacking. I'm also a keen nature photographer. I like to get outdoors and then write about it. I created this site to help people find the right gear so they enjoy their outdoor pursuits that much more. Skilled Adventurer is a participant in the Amazon Services LLC Associates Program, an affiliate advertising program designed to provide a means for sites to earn advertising fees by advertising and linking to amazon.com.